The perfect way to usher in spring is with a showstopping Coconut-Almond Chiffon Cake that’s light in texture, but not in flavor. For the cake, sift together flour, 1 cup granulated sugar, baking powder, and salt in a large bowl. Whisk together egg yolks, coconut milk, oil, rum, and almond extract in a separate bowl; add to dry ingredients and whisk until smooth. Beat 8 egg whites and cream of tartar in another large bowl with a hand mixer on medium speed until soft peaks form, 5 minutes; increase speed to medium-high. Gradually sprinkle in remaining ½ cup granulated sugar and beat until whites are stiff and glossy, but not dry, 2–3 minutes more. Whisk one quarter of the egg whites into the cake batter. Fold in remaining whites, in three batches, adding more when no streaks remain. Pour batter into an ungreased 10-inch tube pan with removeable bottom set on a baking sheet. Bake cake until a skewer inserted into the center comes out clean, about 1 hour. Invert tube pan onto the neck of a bottle and cool completely upside down, about 2 hours. To remove cake from pan, run a knife around the sides and carefully push the bottom out. Use a knife to release the tube portion from the cake. For the toppings, whip cream with a hand mixer until thick; add powdered sugar and continue to whip to soft peaks. Add rum and whip just until combined. Assemble cake by halving it horizontally with a serrated knife. Spread half the jam over the bottom half of cake. Pipe about half the whipped cream over jam; place top cake layer on bottom half. Spread remaining jam and whipped cream over the top. 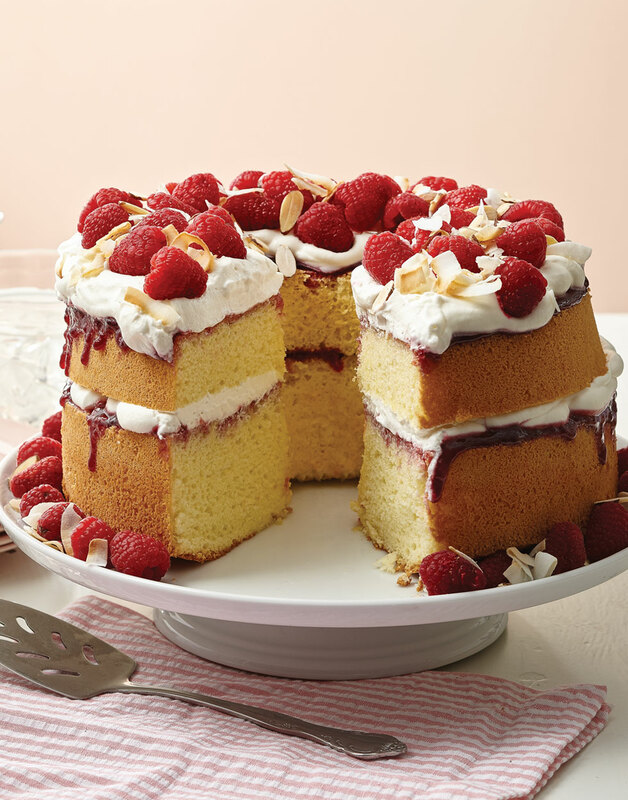 Top cake with raspberries, toasted coconut, and sliced almonds. Serve cake immediately. For the lightest texture in the cake, beat the egg whites until they’re stiff and glossy. Use an over-under motion to fold the egg whites into the batter without deflating them too much. To prevent the cake from collapsing, creating a heavy texture, cool cake completely upside down.